My young steersman had never climbed to Alsop-en-le-Dale. “It’s about six miles, said he, consulting the map; “half an hour at the outside.” I just lay doggo, knowing that the luxury of a long smoke would be mine when the edge of his energy had been blunted by the banks. And it was so. Years ago I took a club party week-ending to Alsop. They arrived at Ashbourne beaten by a veritable gale. “It’s only six miles further,” I said; “it’s foolish to stay here for tea.” And they came on, but their execration of me has not ceased yet, although the occasion was 25 years ago. We climbed high into the wolds, beauty abode with us, and the tang in the wind made life sparkle. At Newhaven Lodge we lunched and spread our maps, for with sixty miles in hand by 12.30 it seemed high time to carry out the threat of a little delving. What good friends maps are when you have mileage in the check of time, and when the wind is blowing the right way and the sunshine falls like a benediction. What do a few hills matter then? So we left the Buxton road at Parsley Hay for a rough lane leading to the romantically-named village of Earl Sterndale. The road became rougher, the hills broken and boldly cragged, with deep snow in their hollows, and through the gaps the rolling country faded into the golden haze, or lifted still higher ridges ahead of us. And it was all our own; only the curlew and the sheep shared with us that broken, rutted, grass-grown way. Now we were climbing the high grouse moors to Axe Edge, and, rising the summit, came suddenly on the busyness of the Buxton-Leek highway. But our objective was Dane Head, followed by the slight drop to the Buxton-Macclesfield road under the fortress-like buildings of the “Cat and Fiddle,” and then, with a little wriggling, the head of the Goyt Valley, that miniature paradise which soon will be partly flooded to provide for the needs of Stockport. The Goyt Canyon opens suddenly out of the limestone hills, and for some eight miles to Taxal provides an exquisite ‘coast’ through sylvan scenery as rare as it is unexpected. For the tiny stream gives one no introduction to its beauty and the lovely little canyon it cut for itself in the remote ages; it just happens as at the opening of a door. You go slowly if you are wise, and absorb its beauty; and in any case slow progress spells comfort, for the road is rough, and presents corners that swirl round the rocks in the affectionate company of the river, and some of the bends hang precipitously over the growing volume of the singing waters. An eight miles drift, and heaven all the way; then Taxal and the ragged industry of dam manufacturer. But I am glad to have seen the Goyt before the flood, because I hope to see it after arid so possess a comparison of beauty. Then I can tell some younger wanderer how I rode on this golden day of March through the deep glen, and the waters were not. It was a shock to strike the setts just beyond WhaIley Bridge, and leap from crag to crag all the fifteen miles to Manchester. That the journey leaves you with a high regard for the enthusiasm of Manchester cyclists who carry their rough road handicap with the imperturbability of stoics. We were a shaken and battered pair by the time we reached the centre of the City of Manchester, but the memory of the Goyt Valley, the sunshine and the balm of the wind brought us to table at the jubilee function of the Wheelers with sparkling eyes and healthy appetites. It was a gallant evening, for ‘the boy that lives in the heart of every man’ had his fling that night. Yet we were up and off betimes next morning, bumping slowly over the road to Chester, leaving most of the traffic at the Knutsford fork, taking a cup of tea at Holmes Chapel, and losing our way in the lanes round about Crewe Hall. 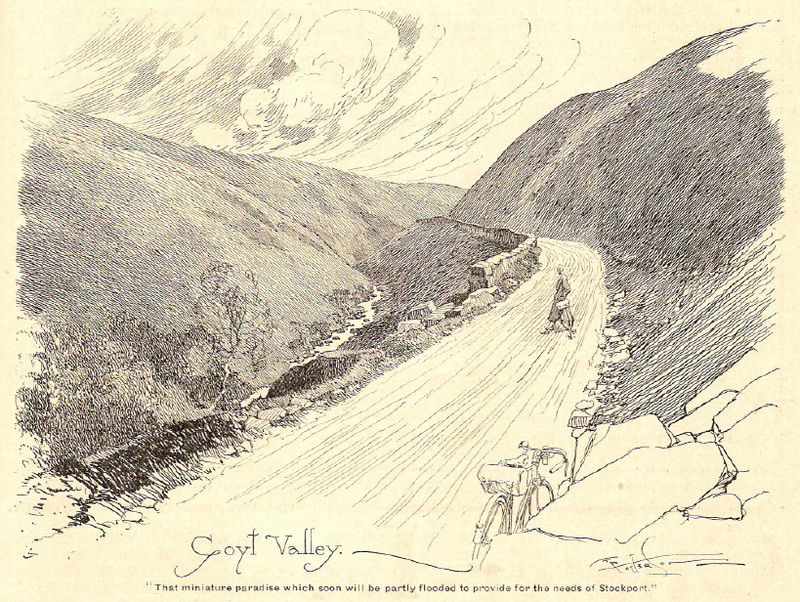 This is the second of two cycling articles from the early 1930s which describe rides through the Goyt Valley. They were kindly sent to me by Peter Jourdain, a keen cycling enthusiast living in Wisconsin in the US. This article comes from a May 1933 edition of ‘The CTC Gazette’, and is written in wonderfully-readable style by Frank J Urry. Peter also mentions the artist of the superb pen drawing featured above the article (see above), Frank Petterson. There’s a YouTube clip of this work which is worth watching here. The ride through the Goyt valley is only part of the article. To read it in full (and it does make very enjoyable reading), click here to download a pdf of all four pages. And click here to read the earlier cycling article from March 1932. Click the image above to view a larger version of this fine illustration by the noted cycling artist, Frank Patterson. It shows the single track road from what is today Errwood Reservoir, up to Derbyshire Bridge. A scene that many people will recognise. But these days you will see the small packhorse bridge over the Goyt below, which once stood in the heart of Goyts Bridge.